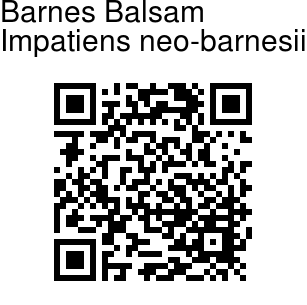 Barnes Balsam is perennial stemless herb, found growing on trees, delicate, drooping; bulbs small, spherical. 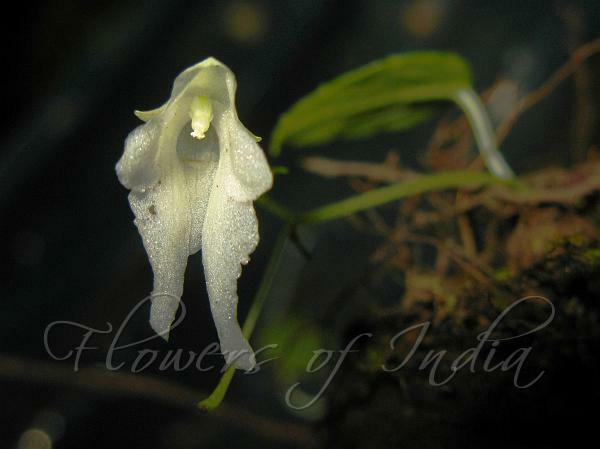 It is named for Edward Barnes (1892-1941), plant collector in Madras. Flowering stems are delicate, hairless, 4-5 cm long, few-flowered; bracts lanceshaped or ovate, somewhat pointed; flower-stalks about 1.5 cm long. Flowers are cream-coloured or almost white, 2-2.5 cm long. Lateral sepals are ovate-sickle shaped, 5 mm long. Lip is ovate-oblong or nearly round, base shortly puch-like at base, 1-1.2 cm long. Petals are delicate. Wings are 2-lobed 1.75-2.3 cm long; upper lobes oblong, blunt, about 7 mm long; distal lobes oblong-lanceshaped, blunt or shortly notched, about 1.5 cm long. Leaves are 1-2, ovate or elliptic-ovate, rounded at base, more or less unequal-sided, pointed or subpointed at tip, remotely finely toothed along margins, 2 - 8 x 1.3 - 3.6 cm, sparsely pilose above, hairless. Capsules are ellipsoid, pointed, about 8 mm long. Barnes Balsam is endemic to Nilgiri hills (Kundah Range - Nilgiri Peak, Makurti, found on moss-covered tree trunks in wet shola forests at about 2,200 m, in Tamil Nadu and Kerala. Flowering: July-September.